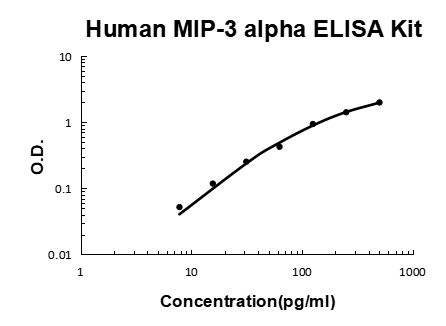 Sandwich High Sensitivity ELISA kit for Quantitative Detection of Human MIP-3 alpha. 96wells/kit, with removable strips. Expressed predominantly in the liver, lymph nodes, appendix, peripheral blood lymphocytes, and fetal lung. Low levels seen in thymus, prostate, testis, small intestine and colon. Chemotactic factor that attracts lymphocytes and, slightly, neutrophils, but not monocytes. Inhibits proliferation of myeloid progenitors in colony formation assays. May be involved in formation and function of the mucosal lymphoid tissues by attracting lymphocytes and dendritic cells towards epithelial cells. C-terminal processed forms have been shown to be equally chemotactically active for leukocytes. Possesses antibacterial activity E.coli ATCC 25922 and S.aureus ATCC 29213. .